Makeup, Beauty and More: New From Origins | No Puffery, Smarty Plants, Drink Up! New From Origins | No Puffery, Smarty Plants, Drink Up! The Smarty Plants CC SPF20 Skin Complexion Corrector ($35) comes in two shades - light/medium and medium/deep. I tried out light/medium - its a a tad light as it is, but since its a very sheer, balmy texture, it blends well without being streaky or looking cakey. I love the scent of this CC cream - a very light, pleasant, refreshing scent that dissipates pretty fast. Smarty Plants is a really nice, lightweight CC Cream that covers minor blemishes and evens skintone. It has the perfect finish that isn't too dewy or too matte. Really like it for my combination, dry sensitive skin! The Drink Up Hydrating Lip Balms ($17) are glossy, hydrating lip balms with a very sheer hint of color. Both colors I tried, Pink Guava and Plum Punch look pretty much the same on my pigmented lips and they both feel great on dry lips. It is quite pricey for a sheer gloss balm though. The texture is a tad thick - its hard to get out of the squeeze tube and I prefer just a dab, best applied with my fingers. Too much can get a little heavy and sticky. Its a nice lip balm for dry lips, very glossy, but the texture could be a tad more thinner just so it will sink in faster, so I can use it during the night as well. No Puffery Cooling Roll On for Puffy Eyes ($25) - I don't have a problem of puffy eyes, so this is just a refreshing roll on I like for when my eyes feel tired. It does a fabulous job of cooling the under eye area and hydrates to an extent. I've tried it under makeup too and it doesn't make my concealer/foundation slide off. The metal roll-on tip is very refreshing and the massaging action feels nice on the under eye area. It also claims to lessen dark circles, brighten the eye area and reduce redness, if any. I haven't tried it so long to see any difference in my dark circles, but if I do, I'll be sure to report back! Also great to have during a long flight! 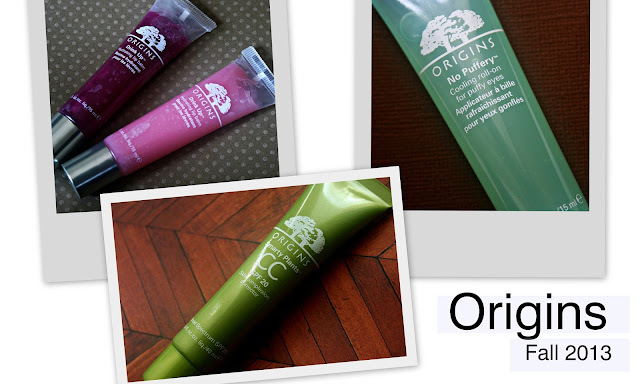 Have you tried any of these new launches from Origins?